Tourism Licence VT-469794-A. This stylish high quality ground floor apartment, built in 2006 to a unique design, has quality fixtures and fittings throughout. This holiday apartment, which almost touches the sea, has three glass fronted terraces and stunning views of the sea. This attractive, ground-level holiday apartment has a large terrace and is located next to a beautiful natural park. Very large 4 bed villa in Los Balcones with private pool in perfect location. Walking distance to all amenities, Torrevieja a few minutes drive away and more. Plenty of Golf, Entertainment & Sun!!! VT-467040-R Superbly furnished lovely air-conditioned apartment with sea views, sleeps 4. Secure parking available. 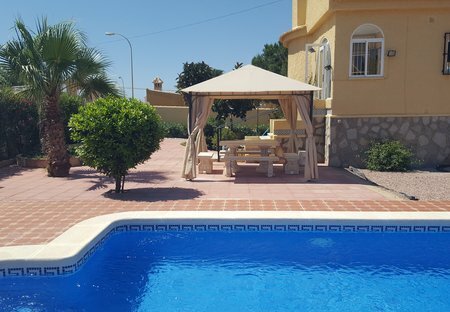 This fantastic holiday home is located in El Chaparall with good infrastructure as well as bus connection to Torrevieja. Especially for children, the aqua park is a big attraction. This centrally located holiday home is in a gated community. The fantastic pool area is suitable for handicapped guests. It also has a separate children's pool. This beachfront apartment with a fantastic panoramic view of the sea offers a nice terrace where you can have breakfast and enjoy the gentle sea breeze. Brand new apartment located in La Mata, Torrevieja, 1 minute walking from the beach and natural pine woods. This well-oriented, ground floor apartment in the popular urban area of La Siesta is equal to a nature reserve. The terrace is suitable for barbequing and relaxing. This 1 bedroom apartment with swimming pool is located in Torrevieja and sleeps 3 people. It has air conditioning and a garden. The apartment is near a beach. This house is located in the popular La Mata in the holiday complex "Torreblanca Marina". This terraced house is spread over 3 levels with conservatories and a beautiful garden plot.